Should there be a green shoot within a garlic clove, do remove and discard it, for it will be bitter and indigestible. And bake the hake wisely – such lovely fish does not deserve the fate of overcooking. Place the potatoes in a pan of water with a pinch of salt and bring to the boil on a high heat. Reduce the heat to a simmer for 15–20 minutes. When the potatoes are done, drain and cool slightly. Peel and set side. Chop the capers, anchovies, garlic and parsley to very finely. Transfer to a bowl and add the lemon juice and 200ml olive oil. Stir well, cover and leave to sit for at least 30 minutes. Preheat the oven to 180˚C/gas 4. Cut the potatoes into thin slices, around 5mm thick. Lay the slices over the bottom of a deep-sided dish. Lay the fish fillets on top and lightly season with sea salt. Anoint the fillets with the remaining olive oil and add the white wine. Place a lid on the dish – failing that, use foil – sealing well. Bake for 25 minutes, checking to see whether the fish is resilient to the touch. Return the dish to the oven for an extra 5 minutes only if necessary. Exercising care, transfer the fish to serving plates and tumble the potato slices on and around. Pour the green sauce into the bottom of the cooking dish and stir once or twice, then swiftly pour over the fish to serve. 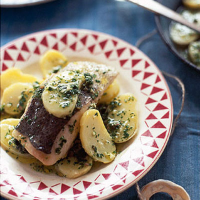 The subtle flavour of hake combined with dense potato and an intense sauce will need a wine with real balance. Try a New Zealand chardonnay, reminiscent of chablis and with a gentle oak influence. Oyster Bay Chardonnay 2007/08 Marlborough, New Zealand. Bin 59287.